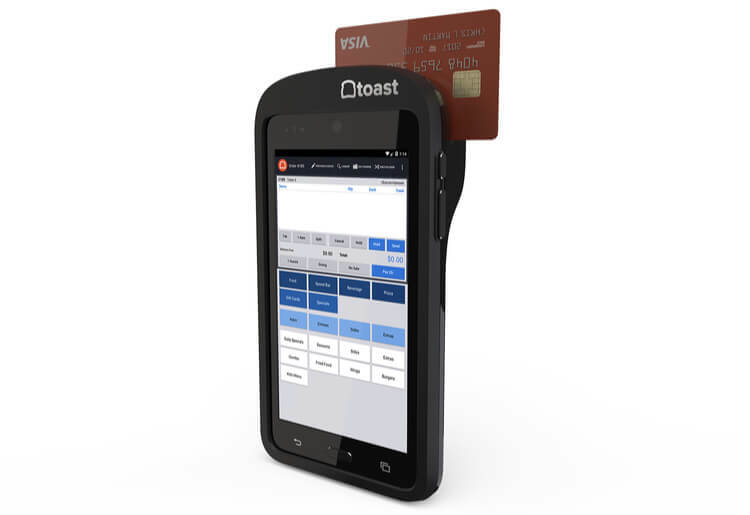 Toast is designed with restaurants in mind, keeping all your tech ingredients in one place for a stellar and efficient POS that makes running your restaurant easy. Toast is a completely web-based platform with all information stored in the cloud. There is a LAN network necessity for customer functionality. 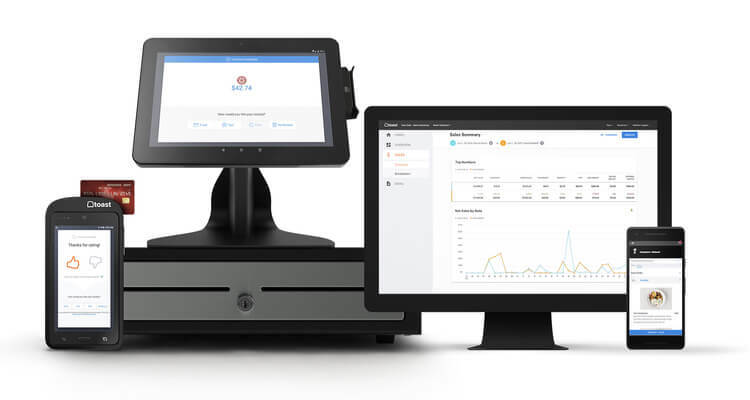 All POS data, mainly your menu and local configurations, are downloaded and cached on individual connected devices. This allows your POS system to function even if your broadband connection drops. No Wi-Fi is needed as the devices are hardwired at POS, however handheld mobile tablets that require Wifi are available. Printing takes place via the local area network. In the event of an outage any credit card transactions are queued locally and then batched when connectivity returns. The main hardware bundle offered is the terminal bundle, which includes a receipt printer, tablet, stand, and credit card reader, with additional routers and kitchen printers sold separately. You can also purchase the mobile device or handheld tablet bundle which enables you to take orders and payments directly at the table. Toast does not use iOS integration and instead works on Android technology. For their hardware bundles they offer Elo tablets, which are set up and configured ahead of time by their operations team. This way all customers are on official Toast hardware, which ensures higher-quality technical support should an issue occur. We’re suckers for good reporting and this is one of the things that Toast really has going for it. From standard sales reports to labor, product mix, tips and more there are a wide variety of reports available. All reports in the Toast POS system are updated in real time so no matter where you’re viewing them you’ll get up to the second updates that change as you view them. The summary report is the most robust as it includes net sales, gratuity, tips, table turn, a complete breakdown of all of your service types, and guest counts. It’s a scan-able dashboard that provides the overview a manager or owner needs when they’re too busy walking the floor to dig through individual reports in the middle of a rush. If you want to drill down into any of the metrics you can do just that with a simple tap. Even if you didn’t have a rep from Toast at your side helping you through setup and training (you do) it would still be ridiculously easy to learn this system. Despite the amazing stretch of features built into Toast you can still master enough to function and run your business in a few hours. It’s not difficult to learn and the 30-60 minute training you receive initially goes a long way to helping you understand it, even without technical skills. Here’s what gets us about Toast: We love that it’s a feature-rich platform for restaurants but the price is really up there. At $100/mo it’s one of the more expensive POS systems on the market and that’s just one terminal. Additional terminals run you $50/mo per device. You do get a lot for that price. That includes the entire run of features (there’s no limitation on features), plus the mobile POS tech, advanced reporting and CRM, 24/7 support, and unlimited updates. This is where you have to think about the ROI of the product and decide if the more efficient operation with a robust platform like this will help you run a cleaner shop, turn tables faster, and thus pay for itself. If you can make it work the way it’s intended then the price isn’t really that bad. For restaurants who expect to need more than 6 terminals, I’d recommend speaking with a rep about custom pricing for volume. And of course Toast does charge for a few add-ons, although they are developed in-house and not externally. Thankfully, there are no contracts required. There is financing available with flexible payment options so you don’t have to pay the full hardware cost upfront, which is likely to pull you into a contract for the equipment. Check with your rep about financing requirements and stipulations. 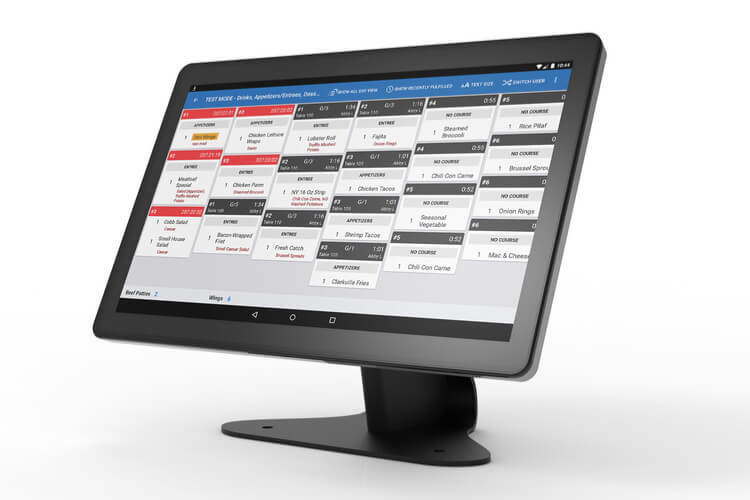 Toast is a true full-service POS system for restaurants that lets you run your entire restaurant from one interface. The feature-rich platform impresses at every level and had us sold on not taking the iOS road. We don’t take issue with Apple products, but we appreciate that it relies on the Android system. That makes it cheaper and more versatile in our opinion, and a great option for those restaurants that prefer not to invest in Apple products.